Father James Groppi speaking through a megaphone from the hood of a bus. "Denial of Absolution" collage featuring likeness of civil rights activist Father James Edmund Groppi by artist Gloria Adair of Milwaukee, Wisconsin, 1966. 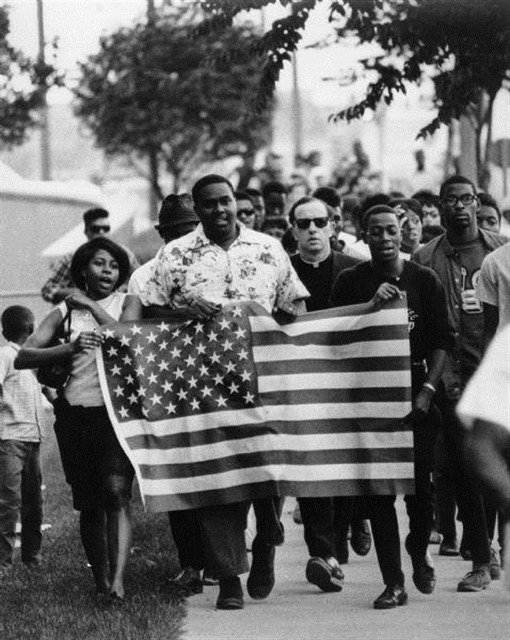 In 1966, Milwaukee, Wisconsin artist Gloria Adair felt compelled to compose a work of art that reflected the current events that unsettled her city as well as honored one of its up-and-coming local figures, activist Father James Edmund Groppi. 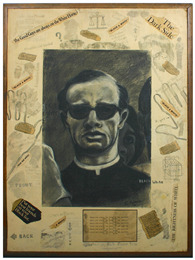 A charcoal drawing of Father Groppi, Roman Catholic priest and renowned fighter for equal rights, serves as a bold centerpiece to this collage entitled "Denial of Absolution." 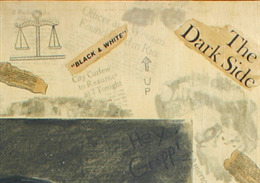 Newspaper clippings, pencil sketches, and handwritten commentaries added around the border provide further testimony of the race relation turmoil that gripped Milwaukee during the late 1960s. As late as the 1960s, African Americans living in Milwaukee were still being denied equal access to housing. Discrimination at the time ran rampant, a trend that began shortly after World War II when Milwaukee's black population began to grow rapidly, expanding nearly fivefold between 1945 and 1960 from 13,000 citizens to 62,458. Without legislation to protect their rights, blacks were readily denied access to housing in many areas of town, forcing them to stay in the inner city amid crushing poverty and decrepit housing. Vel Phillips, Milwaukee's first female and first black alderperson, began her crusade against this alarming trend early in her career on the Common Council. In 1962, she introduced a fair-housing ordinance, but, save for her voice, the Council unanimously voted the ordinance down year after year. 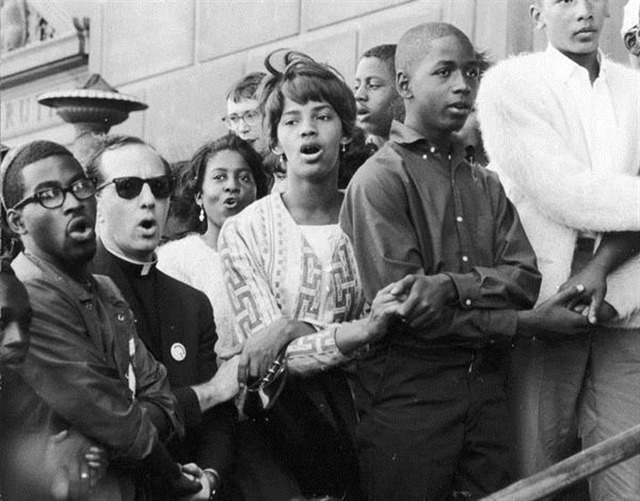 By 1967, however, the mission for equal housing rights gathered steam when Father Groppi, who had spent several years as an activist in Milwaukee and elsewhere, brought his growing following of non-violent protesters into the fray. Born in 1930 in Milwaukee, Wisconsin to Italian immigrants, Groppi was ordained in June 1959 and practiced as a Roman Catholic priest in the Milwaukee area. After a stint at St. Veronica Church, he was moved to the predominantly black parish of St. Boniface located in Milwaukee's inner city in 1963. It was here Groppi first became an activist, becoming an advisor to the National Association for the Advancement of Colored People (NAACP) Youth Council in Milwaukee. Groppi participated in protests in Selma, Alabama with Dr. Martin Luther King, Jr. and fought against segregation in Milwaukee Public Schools and the Eagle's Club, an all-white fraternal organization of which many Milwaukee politicians and other prominent members of society were members. When Groppi joined the fight for fair housing in 1967, he became the quickly recognizable white face of an otherwise black crusade. 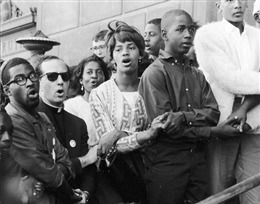 Racial tensions across the United States reached their breaking point that summer, and race riots erupted in many major urban areas, including Milwaukee in July 1967. As a result, Mayor Henry Maier placed his city under a 24-hour-a-day curfew. He then revealed his 39 Point Program aimed "to help alleviate racial and social problems in Milwaukee." Some civil rights leaders questioned the mayor's approach given that thirty-five of the changes were technically out of his control since they required county, state or federal assistance. 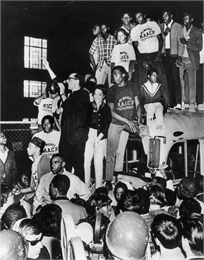 Nonetheless, Maier still received national recognition for what was seen as a fast reaction to the riot. Dissatisfied, Groppi began a series of marches that endured for 200 days to protest the continuing unfair housing practices. Milwaukee Journal reporter Frank Aukofer wrote, "[H]ere was a white, Italian-American, Catholic priest running around with a group of preteens and teenagers, running civil rights protests. That was the thing that made it a national story." Indeed, by the time the situation really heated up in August 1967, Milwaukee had become the focus of the national news. Aukofer dubbed the controversial Groppi "the sandpaper that rubbed the white majority raw." On August 28, 1967, Groppi made the daring move to lead his NAACP Youth Council members across the 16th Street Viaduct to the predominantly white neighborhoods of Milwaukee's South Side. Residents there hurled both taunts and projectiles at the protestors who were left unprotected by the police. As tensions escalated, The Youth Council Freedom House was burned down the next day. Two days after that, Groppi and Phillips were arrested alongside 135 other protesters. Despite their hardships and struggles, Groppi and Phillips's work came to fruition in spring of 1968. By then, 12 Milwaukee suburbs had finally adopted open-housing laws. After Dr. King's assassination in April of that year, Congress passed federal open-housing legislation, at which point Milwaukee's mayor announced he would enforce the new policy in his own town. This action finally led to passage of Phillips's bill by the Council on April 30, five years after its introduction. Over the years, Groppi championed other causes as well, perhaps most famously his work as an intermediary alongside Marlon Brando in 1975 for the fight between the Menomonee Indians and the Alexian Monastery in Gresham, Wisconsin. He married in 1976, which forced him to no longer practice as a Catholic priest. Although he went on to attend Episcopalian seminary and worked towards priesthood in Detroit, he grappled with whether or not he could spiritually move after his former commitment to Catholicism. In the end, he returned to Milwaukee to work as a bus driver and died of cancer in November 1985.